© 2003 Lucia Eames dba Eames Office (www.eamesoffice.com) Santa Monica, California, and © the Estate of Eero Saarinen. Photograph by R. H. Hensleigh and Tim Thayer. 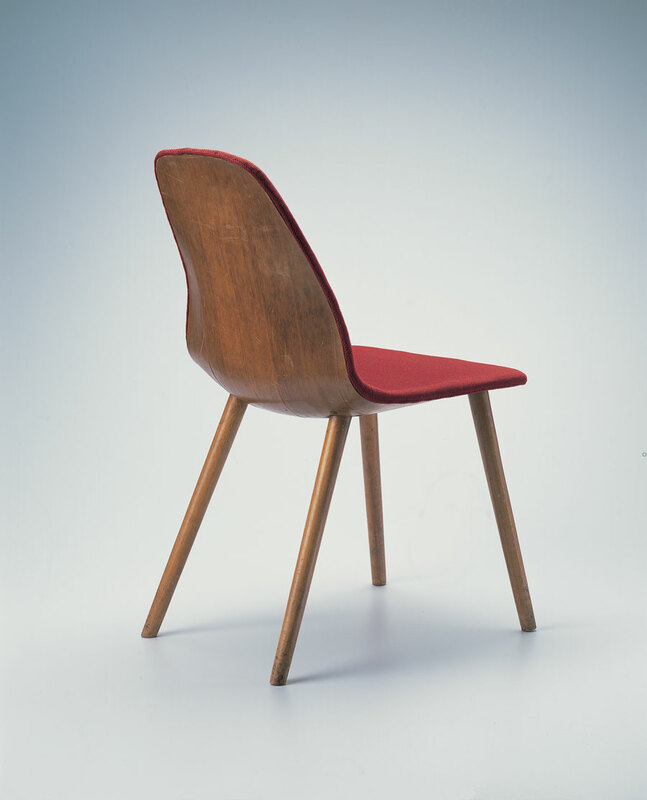 Eero Saarinen and Charles Eames’s Side Chair was first exhibited at New York’s Museum of Modern Art in the 1941 “Organic Design in Home Furnishings” competition, an exhibition often regarded as the formal beginning of mid-century American modernism. Designers who were invited to participate in this competition were charged with creating low-cost furniture and other household items for the American public. Saarinen and Eames won first prize for their “Seating and Other Living Room Furniture” which included a suite of Side Chairs, other chairs, and a variety of modular case units. All of the Saarinen and Eames chairs featured a three-dimensional bent plywood shell with foam rubber padding covered in fabric upholstery. Cranbrook’s Side Chair, with its original upholstery, demonstrates the technological achievement of bent plywood, producing a chair both lightweight and attractive. While most of the chairs had visible imperfections caused by the pieced wood laminate and were completely upholstered, Side Chair, made with Honduras mahogany veneers, was successful enough to retain its exposed back. This chair laid the foundation for further innovations in modern seating design by Saarinen and Eames as well as other designers.